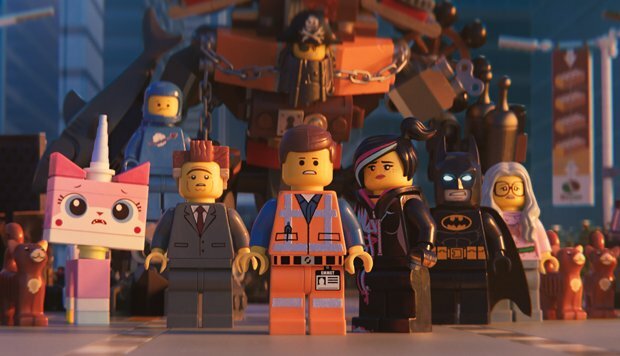 The follow-up to 2014's The Lego Movie is upon us. That means more bricks, more building, more songs, more glitter and more celebrity cameos. And, if you were being cynical, more of the same. Picking up from the meta finale of the original, when indestructible Duplo invaders beamed into town, The Lego Movie 2 then skips forward five years. Everything is no longer awesome, and our plastic chums are now living in Apocalypseburg, a Mad Max-style nightmare. Only construction worker Emmet Brickowski (voiced again by Chris Pratt) remains cheery and he's even built a house for himself and love Lucy (Elizabeth Banks). But why did he have that strange dream that threatens destruction? He soon finds out when an alien queen (Tiffany Haddish) sends her minions to kidnap Emmet's friends, including Benny the Spaceman (Charlie Day) and Batman (Will Arnett), so they will participate in a 'matrimonial ceremony'. When Emmet blasts off into space to rescue them he meets Rex Dangervest (also Pratt), a tough-nut version of himself from the future. Cue lots of jokes about Back to the Future and Hot Tub Time Machine. The in-jokes don't stop there, with Bruce Willis in Die Hard-mode making a random appearance, while there are more tunes than your average musical – the best being 'Catchy Song' ('This song's gonna get stuck inside your head'). Scripted by the original's directors Phil Lord and Christopher Miller, Trolls' Mike Mitchell takes over helming duties and he keeps the action flowing, even if he can't stave off the feeling that this sequel is not quite on a par with the magical original. Still, with breezy animation from Animal Logic, Richard Ayoade voicing a talking ice cream and Jason Momoa popping up as Lego Aquaman, there's still plenty of brick-based fun to be had.